In a report for the FAO, I. Bergier, E. Soriano, G. Wiedman and A. Kososki outline a project in the Brazilian state of Mato Grosso do Sul, in which pig manure is used in a biodigester, producing power, fertiliser for food crops and wood/paper as well as biochar. The project is an example of biotechnology being employed for sustainable agriculture. Among the major challenges of the near-future agriculture is achieving the ability to simultaneously provide enough food and ecosystem services to urban societies, while providing 'equivalent urban opportunities and benefits' to rural smallholders, who represent more than 50 per cent of the global food production (Herrero et al., 2010; Lee et al., 2012). Meeting this challenge would considerably reduce rural exodus to the cities and, at the same time, achieve a more adequate point of equilibrium between food security and the provision of ecosystem services on Earth (Uriarte et al., 2012). Biotechnologies have a complementary role to play in achieving these goals. Large-scale, intensive farming systems usually comprise monocultures designed to provide a limited range of product outcomes. In the case of Brazil, most monocultures are focused on the production of sugarcane for sugar and/or ethanol, eucalyptus for wood and paper industries, and soya and grains for intensive production of livestock (e.g. for milk, beef, pork and chicken) and modern industrialised human foodstuffs. Although large-scale farming has been highly profitable and has contributed greatly to the Brazilian export market, this production model has numerous drawbacks, including: the concentration of land, financial wealth and other resources; increased rural exodus; and loss of ecosystem services such as water production and purification, carbon sequestration in soils and forestry and several other biogeochemical processes involving local and regional biodiversity. the services to provide technical and financial assistance to the newly settled families were grossly inadequate. To address this problem, the Brazilian Agricultural Research Corporation (EMBRAPA) undertook a study with the Ministry of Science, Technology and Innovation (MCTI) and the Ministry of Agriculture, Livestock and Food Supply (MAPA) to identify critical factors for the successful resettlement of smallholders. The first factor noted was the need to recognise or envisage local and regional strengths and weaknesses regarding rural productivity. This can be best achieved by inspecting local and regional natural resources and noting the presence or absence of established markets and industries and assessing the available knowledge and capacity for innovation. The project Intensive and Integrated Farm Systems for Smallholders in São Gabriel do Oeste, Mato Grosso do Sul, Brazil (Campanário Settlement - 19°16’46.90”S, 54°36’2.35”W), is a good example of incorporating biotechnologies into a successful programme of re-establishing families in rural settlements, while maintaining their dignity and ensuring adequate power of consumption. The Campanário Settlement comprises 142 families on 2,850 hectares, i.e. 20 hectares per family. The core scope of the project is the maintenance of smallholder families in the food production system by having access and opportunities as similar as possible to those of families living in nearby cities. The project is a collaborative effort involving EMBRAPA, a local cooperative called the Cooperativa Agropecuária São Gabriel do Oeste Ltda (COOASGO) and a local company (Retificadora Centro Sul) and is built on the idea that it is possible to use biotechnologies to profitably transform potential swine industry pollution into profitable and useful products while simultaneously promoting favourable balances of energy, water and nutrients with social inclusion. The excess organic material and energy from swine production is converted into new products that can be commercialized by the cooperative at favourable prices and with the sharing of profits, thus substantially increasing the revenue of the settlement dwellers. The initiative was started in 2008 by the City Hall of São Gabriel do Oeste, underlining the importance of the local government in the success of the Campanário Settlement. At that time, COOASGO, in partnership with the city government, EMBRAPA, MCTI and MAPA started a programme of social inclusion for 13 selected smallholder farmers by enabling the construction of thousand-head swine production facilities with a shared fertirrigation system (where fertilisers are applied with irrigation water). Two contiguous swine farms were chosen to implement a pilot-farm unit with the installation of a laboratory (gas chromatography, computing and water quality monitoring), in operation since May 2012, and a facility for demonstration of power and solid fertiliser production, in operation since April 2012. 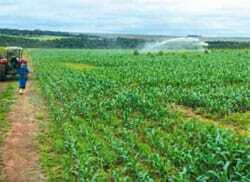 The selection of farms was based on the perceived capability of each family to follow the guidelines established by the cooperative to improve productivity, reduce the use of non-renewable resources and, consequently, mitigate the pollution of air, water and soil. "The controlled use of the anaerobic biodigestion or fermentation can be considered as one of the most important biotechnologies created by Mankind." A private company (Brascarbon) interested in certified emission reduction under the Clean Development Mechanism of the Kyoto Protocol also collaborated by constructing biodigesters and agreeing to transfer ownership of the digester to the settlers after seven years of operation. In addition, the digester effluent and a portion of the biogas generated were allowed to be used by the smallholders under the previously described Intensive and Integrated Farm Systems for Smallholders project, which is funded by the MCTI and the National Research Networks in Agrobiodiversity and Agricultural Sustainability programme (CNPq/REPENSA). The controlled use of the anaerobic biodigestion or fermentation can be considered as one of the most important biotechnologies created by Mankind. For example, it serves as basis for the production of numerous products for human consumption, silages and by-product feeds for livestock production and ethanol as a biofuel. In the case of effluents produced by concentrated populations of humans (cities) or animals (livestock), biodigestion has become a common technique for secure disposal and water treatment. The commercial pig industry demands precise control of the materials and components of the swine diet. COOASGO has the advantage of producing its own feed with selected materials designed to optimize feed conversion efficiency. In the typical Brazilian production system, pigs are marketed after 120 days of confinement, meaning there are three cycles of swine production per year. The fermentation of swine effluent has two main outputs: 1) biogas for power generation and, 2) biofertiliser, which can fully replace mineral fertilisers in well-managed (i.e. kept at a high fertility level) soils of agro-ecosystems. The biogas is reasonably enriched in methane (more than 50 per cent) that has an average heat of combustion of around 55MJ per kg. Considering that anaerobic biodigestion of animal waste can provide renewable energy and renewable fertiliser, its widespread integration into the swine industry and other agricultural sectors seems nearly inevitable, in particular in West Central Brazil. The anaerobic biodigestion of effluents from the swine industry is now so important that the traditional crop production areas of West Central Brazil are steadily becoming the main areas of swine production. This scenario favours the 'Intensive and Integrated Farm Systems' project for the successful social inclusion of smallholder farms in Brazil. The project can be applied on both large and small farms; it is suitable for cooperatives and is extraordinarily effective at improving productivity while reducing pollution. A local company named Retificadora Centro Sul has developed a unique engine (Rieger, 2006) to convert the biogas into either mechanical or electrical energy. The development was achieved after five years of exhaustive tests carried out on diesel engines adapted for biogas by means of special electronics and automation. The power efficiency of these engines is 40 per cent, which is astonishingly superior to similar engines available worldwide. An adapted diesel power station of 100kW can run continuously on inputs of 40 cubic metres of biogas per hour. Considering that a single adult pig has the potential to produce wastes yielding roughly 0.5 cubic metres of biogas per day (Bergier et al., 2012a), a population of 2,000 animals can produce 100kW of power, which is very attractive for the alternative energy market in Brazil. However, this component of the project still requires government regulation of the market at the state level to be properly implemented. "The anaerobic biodigestion of effluents from the swine industry is now so important that the traditional crop production areas of West Central Brazil are steadily becoming the main areas of swine production." A fraction of the power is used for dispersing the biodigester effluent onto pasture, crop, or forest land or combinations of these in different proportions. This process is called fertirrigation, where a pump draws the effluent, whose annual production from 2,000 swine is about 7,300 cubic metres (Bergier et al., 2012a), and moves it through stainless steel pipelines to a series of three or four manually regulated valves. At these valves, a pipeline reel has been connected that disperses the effluent over rectangular plots of three hectares each with pasture or corn, each of which are adjacent to eucalyptus groves. Retificadora Centro Sul also designed this technology, which includes a special pump driven by biogas (Rieger, 2006), so the entire processes of power generation and fertirrigation are completely driven by renewable energy. Consequently, instead of simply burning the methane to decrease the impact on climate change, the project uses it in a beneficial way, thanks to the locally-developed technology. The local knowledge in São Gabriel do Oeste was crucial not only to the sustainability of the swine production enterprise but was also integrated into the production of other foods (such as milk, beef and grains) and material (eucalyptus wood and solid fertiliser). For every 1,000 swine, the effluent produced can safely fertirrigate an area of 10 hectares (Bergier et al., 2012a). 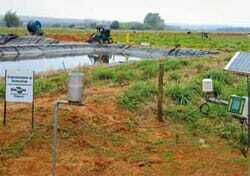 The effluent has been applied to pasture, corn and soybean fields and a small eucalyptus plantation. As a result, with fertirrigation of 180 cubic metres of biofertiliser per hectare per crop cycle, the increase in yield of the pasture land has allowed the community to double its milk production, while also increasing the productivity of corn and soya. The fertirrigated eucalyptus in this study was planted in 2011/2012. With this application rate, the wood produced is expected to be available for the market in four years, substantially earlier than the standard seven years using conventional forestry technology. The biogas and the swine effluent are also key inputs in the process of creating a novel solid fertiliser. This fertiliser is produced by pyrolysis of the nutrient-dense (especially nitrogen, phosphorus, potassium, calcium, magnesium and other micronutrients) digested swine solids, yielding a material with biochar-like properties. The biochar is produced under special conditions that impart to it the properties of slow nutrient release and high humidity retention, allowing it to improve soil quality and carbon content, thus improving the productivity and the sustainability of the mixed livestock and cropping system. The machinery and process of production of this special biochar were developed by EMBRAPA, Retificadora Centro Sul and COOASGO and are currently undergoing the patenting process (Bergier et al., 2012b, 2012c). The machine for solid fertiliser production in the pilot-farm yields about 800 kilograms of biochar per month (unpublished data). Laboratory-scale biochar production from digested swine manure is discussed in Bergier et al. (2013). All of these products - renewable power, fertirrigation of agro-ecosystems and biochar - are also contributing to the restoration of natural forestry for recovering the ecosystem services of a portion of the farmlands, in association with the National Institute of Colonization and Agrarian Reform (INCRA), as a strategy to help cope with the extreme weather events (droughts or floods and increased temperatures) expected under future climate change scenarios. The project has the vital collaboration of two government Ministries (MCTI, MAPA), universities (Federal University of Mato Grosso do Sul - engaged in monitoring groundwater; State University of Campinas – modelling by means of Life Cycle Analysis and Energy; and Federal University of Paraná – Principles of Integrated Farm Production: PISA), and institutes (National Institute for Space Research – greenhouse gas and atmospheric transport and Federal Institute of Mato Grosso do Sul – database development, sensor network development and electronics and automation knowledge transfer), with a grant from MCTI and CNPq/REPENSA. The CNPq/REPENSA grant has been used for monitoring key processes (gaseous emissions, water and soil qualities) taking place in the pilot-farm. To inform the public about the project, a group of about 30 students between nine and 14 years of age from the Dorcelina Folador state school in the settlement were familiarised with the project as part of a strategy to transfer the knowledge in open source hardware and software (Arduino), and, specifically, to promote the use of technology and innovation for achieving sustainability by the next generation of the Campanário Settlement. Bergier, I., Melo, T.J.G., Franco, E., Rech, R., Silva, D.S., Oliveira, G. S., Alves, L. A., Moraes, A., Kososki, A., Santos, K., Buller, L.S., Ortega, E., Fernandes, C., Silva, R., Silva, P., Gabas, S.G., Lastoria, G., Moraes, O., Ramos, F.M. & Ribeiro, T.T. 2012a. Fertirrigação e agricultura de baixa emissão de carbono: Resultados do projeto CNPq/REPENSA em São Gabriel do Oeste. Boletim de Pesquisa e Desenvolvimento 116, Embrapa Pantanal, 30 pp. Bergier, I., Rieger, L.A.O., Shimata, L.A. Borgmann, J., Sobrinho, A.A.B., Comastri-Filho, J.A., Monteiro, H.C. & Pinesso, J.A. 2012b. Equipamento para separação e conversão termoquímica da fase sólida de efluentes. Applicants: EMBRAPA, COOASGO, Rieger Irrigação Ltda. Patent application number BR2020120212248, 23 August 2012. Bergier, I., Rieger, L.A.O., Shimata, L.A. Borgmann, J., Sobrinho, A.A.B., Comastri-Filho, J.A., Monteiro, H.C. & Pinesso, J.A. 2012c. Processo de obtenção de fertilizante e condicionador de solo a partir de lodo de efluente semi-líquido derivado de biodigestores. Applicants: EMBRAPA, COOASGO, Rieger Irrigação Ltda. Patent application number BR1020120212196, 23 August 2012. Bergier, I., Vinhal-Freitas, I. & Guiotoku, M. 2013. Low vacuum thermochemical conversion of anaerobically digested swine solids. Chemosphere, 92(6): 714-720. Herrero, M., Thornton, P.K., Notenbaert, A.M., Wood, S., Msangi, S., Freeman, H.A., Bossio, D., Dixon, J., Peters, M., van de Steeg, J., Lynam, J., Parthasarathy Rao, P., Macmillan, S., Gerard, B. McDermott, J., Seré, C. & Rosegrant, M. 2010. Smart investments in sustainable food production: revisiting mixed crop-livestock systems. Science, 327, 822-825. Rieger, L.O. 2006. Motor estacionário modificado para gás metano. Patent number: BRMU8602925U, F02B 75/02, 06 November 2006, 01 July 2008. Applicants: Retificadora Centro Sul Ltda; Rieger Irrigação Ltda. (available at www.inpi.gov.br/portal/artigo/busca_patentes). Uriarte, M., Pinedo-Vasquez, M., Defries, R.S., Fernandes, K., Gutierrez-Velez, V., Baethgen W.E. & Padoch, C. 2012. Depopulation of rural landscapes exacerbates fire activity in the western Amazon. Proceedings of the National Academy of Sciences, 109, 21546-21550. This chapter is from 'Biotechnologies at Work for Smallholders: Case Studies from Developing Countries in Crops, Livestock and Fish'. Edited by J. Ruane, J.D. Dargie, C. Mba, P. Boettcher, H.P.S. Makkar, D.M. Bartley and A. Sonnino. Published in 2013 by the United Nations Food & Agriculture Organization (FAO).